1. 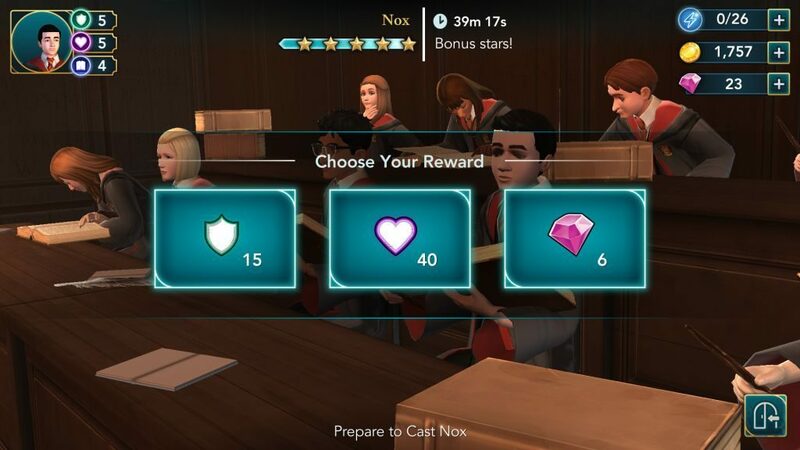 When you earn a star for completing an activity in a class, you can choose one from three rewards. Although rare, gems also find a place in reward options. When you spot such an opportunity, tap the pink gem icon to get one. You can easily earn coins and attribute points, but not gems. So if a gem is a reward option among others, you should prefer the pink trinket over other rewards. 2. You also earn gems when you level up. To level up your character, you will need XP. If you want to level up your character faster to get gems, you should attend classes. Every time you tap an action bar in a class, you gain little XP. You may also receive XP as bonus rewards after a class ends. You will also get more XP when you win a duel and complete a chapter, story mission or a side-quest. 3. Finishing story-based tasks and side quests is another way to get gems for free. 4. Learn special charms like Lumos, Wingardium Leviosa, Alohomora and Nox. You can unlock special charms using stars. To get stars, complete 1-hour, 3-hour or 8-hour classes and use them to learn these charms. You will get 5 gems for completing a special charm. 5. Brewing special potions will also earn you gems. Learn potions, such as Cure for Balls, Wiggenweld, Sleeping Draught and Herbicide potion. You will get 5 gems per potion. Again, you will need to unlock these potions by completing timed lessons. You will learn new potions and charms when you advance to the next year. 6. Level up friendship with fellow students to gain +5 gems. Interact with your friends to raise the friendship level for each of them. Interaction missions appear occasionally so keep looking for such tasks. You can interact with friends by playing Gobstones, instilling confidence in them to join you in your adventures, eating meals at the Great Hall etc. 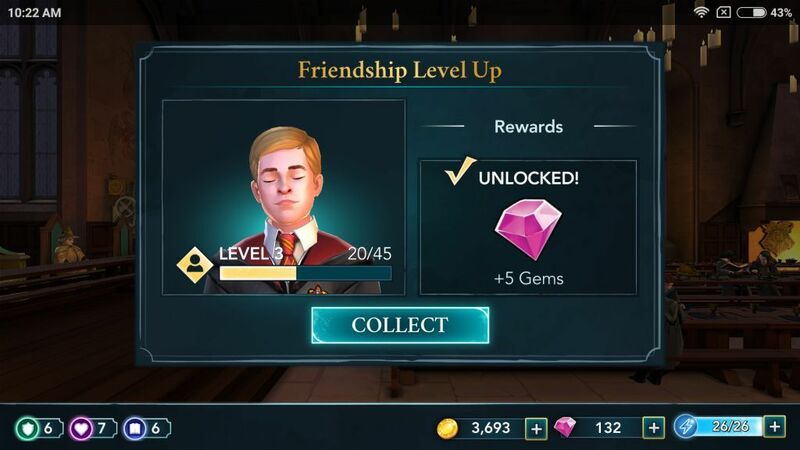 You will receive bonus gems when your friendship with a fellow student reaches a new level. Make sure you choose the right dialogs while interacting to earn diamonds. Once the interaction is over, you will receive friend points which are used to upgrade your friendship level. 7. You may have to wait for 1-3 hours to meet someone at the Great Hall or discuss strategies with your house members or friends. Here, you can use gems to skip waiting hours and instantly meet the concerned person. I wouldn’t recommend using gems in such situations. You will be using up lots of them to reduce wait times. Save gems only for energy refills, so that you can keep yourself busy learning new charms and potions and earning more house points. 8. 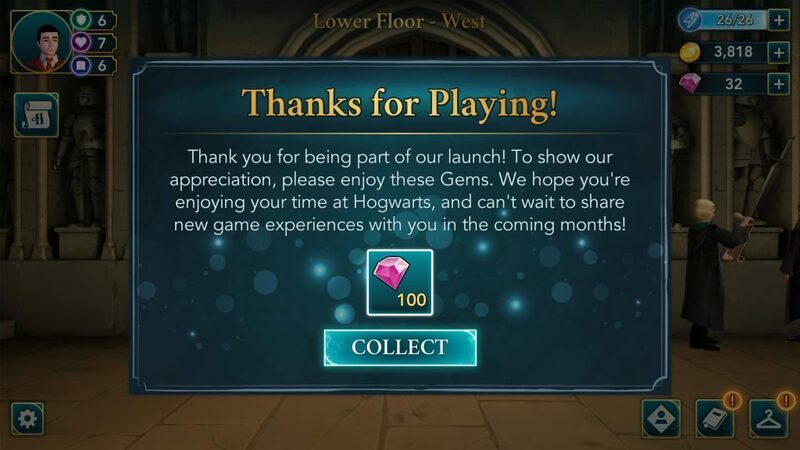 Now Harry Potter: Hogwarts Mystery developers are giving away 100 gems to players as launch rewards. Just open the app, if you haven’t yet, and tap the “Collect” button at the bottom of a window that pops up on the screen. Save these gems for energy so that you can spend those to complete classes for main charms/potions without waiting for a refill. Unfortunately, the 100 free gems must have happened while I was too busy with work to get on the app. By the time I got back on, they were no longer available ??? ?